The average fish oil price in the last quarter of 2012 was USD 2 183 and this was 43% higher than the average price in the last quarter of 2011. Growing demand for fish oil both from high-value aquaculture and human consumption, coupled with weak supply in 2012 are likely to maintain these record fish oil prices into 2013. Fish oil production from Latin America and northern Europe declined in 2012, with the exception of Iceland, thanks to higher raw material supply for the latter. 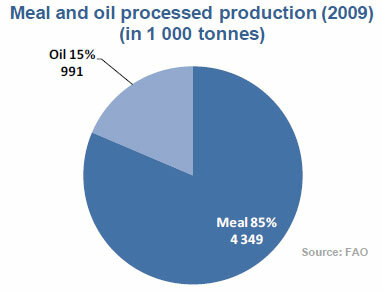 Thus, total production fell 27% between 2011 and 2012. Slow production in 2012 suggests that limited supplies relative to strong demand will continue to maintain fish oil prices in 2013. The largest volume of fish oil exports in 2012 was absorbed by Denmark, taking 30% of Peruvian fish oil exports. This was a 53% increase over Peruvian fish oil exports to Denmark in 2011. Other top Peruvian export markets in 2012 were Chile and Belgium. Approximately 42% of Chilean fish oil exports in 2012 were destined for its top Asian markets of Japan, China, Viet Nam and Indonesia, the same trade pattern as in 2011. USA exports of fish oil are small in comparison with Latin American fish oil exports, primarily because of the high utilization of domestic fish oil within the USA market. Strong consumer demand for carnivorous fish and shrimp continue to maintain fish oil prices, an ingredient essential for the health and growth of these high-value farmed species. Although human consumption of fish oil is small by comparison with aquaculture utilization, future growth in direct human consumption of fish oils will contribute to upward pressure on fish oil prices.